Ever read a recipe and thought “….hmmm that could work …maybe.” and the results were beyond your wildest imagination!? That’s what we have here, my friends! I’ve been using the License to Grill cookbook a lot lately. The recipes are so uniquely sophisticated I really don’t know what to do with myself. But I know what you should do; do get to the nearest grocery or farmer’s market and pick yourself up some peaches and make this recipe – post HASTE! remove stone and grill on cut side first for 3-4 minutes over medium heat. Turn over then brush with glaze and let them grill another 3-4 minutes. Place in serving dish and glaze again. You’re in for a real treat! We’ll have to try these. Fred LOVES peaches! Oh wow balsamic vinegar? Really? I gotta try…that sounds really good. One of the smartest lesson I ever learned was to make a balsamic reduction and keep it in a squeeze bottle in the fridge for when just such an great recipe comes along. I have a squeeze bottle, but I’ve been putting my reduction in a tiny ziploc thingy. THANK YOU! I’m off to make the switch and a much larger batch because I couldn’t agree with you more! 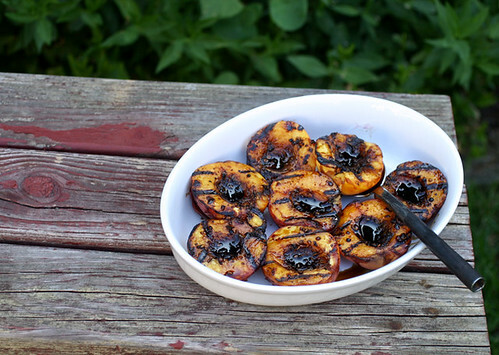 I just bought peaches to grill them will try some this way…sounds good…I do mine with amaretto…cant wait to try some like these they look great! That does sound outstanding. Peaches are in down here so I’m going to head to the nearest orchard and get a fresh bushel! Thanks for a great post and gorgeous picture. How is it that I can not get enough grilled fruit in the summer? It’s so bad here that I’m even using a fish basket to grill even the tiniest fruits. Grill on! 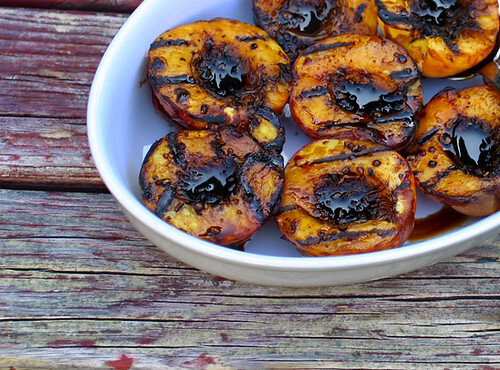 I’ve always wanted to grill peaches, but just never have done it – yet. These looks SO good and I love that they are glazed with balsamic *and* molasses! That looks really good. I am printing this up right now to try for a weekend barbeque coming up..
I’m not a huge fan of peaches. But I love the idea of them being grilled with balsamic vinegar. Yum! I haven’t cooked from License to Grill in a long time. I also love that book. These peaches look so good. I want some right now. Hi Mary – we’ve made this glaze a few times already this summer, thanks for the inspiration. It rocks! Thank YOU Lori! I left a comment on your blog too about Rouxbe from FoodBuzz reccomending reducing a bunch of balsamic vineger so that you can have it on hand. i put mine in a squeeze bottle in the fridge so it’s always at the ready.